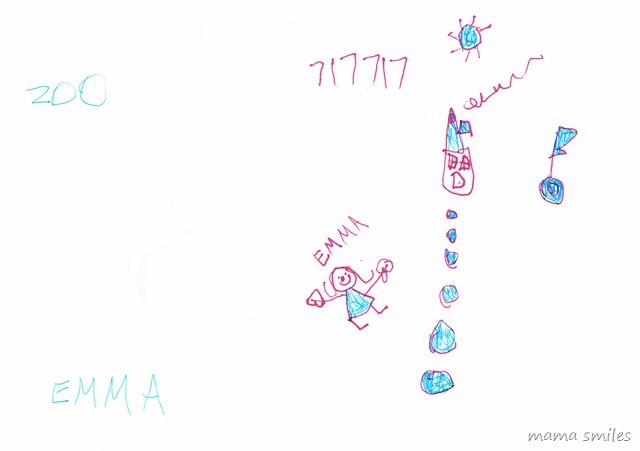 Emma drew the above picture yesterday morning. It’s a ink drawing of her (complete with her name), a house, a (very large) key to get into the house, and stone steps leading up to the house. I was very impressed by the perspective with the stones getting smaller as they approach the house, although I have no idea if it was intentional. The house has a (mostly detached) chimney with smoke coming out, and sun overhead. 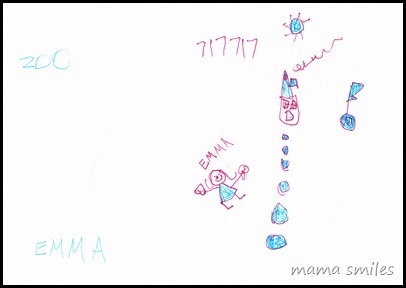 She was apparently practicing the numbers one and seven, and she wrote “zoo” and “Emma” – two words she can consistently spell on her own. I decided to get Emma a couple of step-by-step drawing books after watching her follow step-by-step instructions to draw houses and cars. We borrowed a couple from the library, but an Usborne “I Can Draw People” book was the only one at her level. Emma followed the directions in the book to draw a queen, two horses, a surprised face, and a few other things that she wasn’t happy enough with to identify for me. One of Emma’s friends gave her an art set with crayons and watercolors for her birthday. Emma used it to create this crayon-and-watercolor drawing several weeks ago. I really like the cat in this picture, but Emma has never drawn a cat like this again. This final picture is my favorite of Johnny’s recent drawings. It includes all of his favorite techniques: jagged lines, scribbles, circles, and spirals. A lot of his drawings are monochromatic, but I really like the different colors in this picture. What a good idea to scan things in. I hate just throwing stuff away, but with a kid that loves to color and paint every day, I’m just not going to save every last piece of artwork! 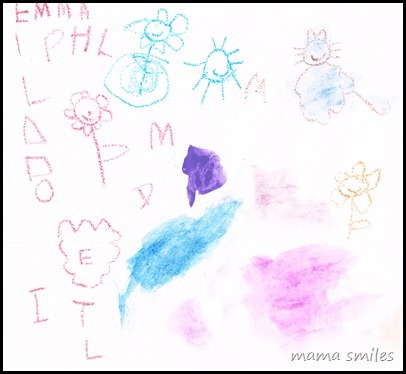 .-= Amber Liddle´s last blog ..Painting, Picnic, and Puddles. =-. .-= Keeling´s last blog ..There was a tree =-. these are great. Noah loves to do art work too. He is not able to draw but only shapes and lines but he still loves it so. .-= Beverly´s last blog ..Happy Monday =-. I just love children’s artwork! I love the little cat too, way too cute and the flowers! .-= Ticia´s last blog ..Our hit of the week =-. I love Emma’s house and the stepping stones. The 1s and 7s crack me up, Matthew is confused about the same two numbers (they look so much alike)… maybe Emma can tutor him. :) She’s a very talented artist! 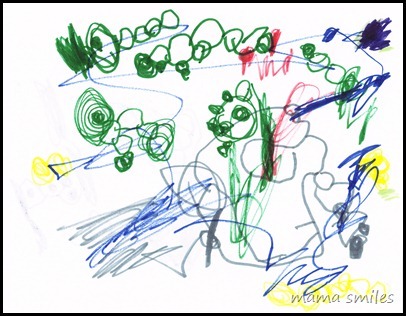 I love all the colors Johnny used and his circles and scribbles – how sweet! And doesn’t it just *look* boyish (or is that just me?)?! I think it’s so great that they love to draw so much and what a wonderful idea to scan them. I really need to do that, or something… we are overrun with artwork here. Thanks for linking up! Love this! I should scan some of our art, it piles up so fast and I have a hard time just throwing it out…that would definitely ease the pain for me. 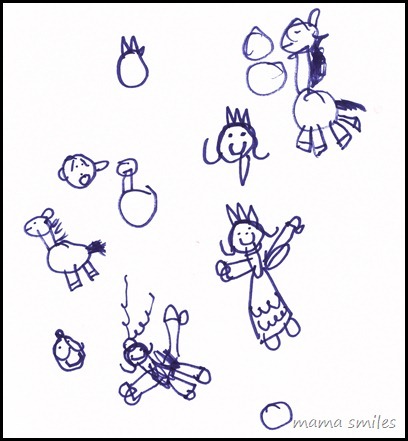 I love the drawings, too, it’s so fun to see what’s in creative little minds. .-= Megan @ Meanwhile, back at the ranch´s last blog ..Pease Porridge Hot! =-. Love them all – so special and unique. I’m most impressed with the stepping stones getting smaller as they go up to the cute house! And it’s a little jumbled, with an extra 1, but at first glance I thought she’d written my birth date!! .-= Elisa | blissfulE´s last blog ..seven times =-. Great idea to scan in your children’s artwork! I like taking pictures of ours because it makes it a little easier to toss it when it’s piling up because we have the digital copy. And, great drawings by the young artists! Great artwork! Scanning – great idea. What a wonderful way to keep the artwork, but minimize the clutter. Lucas once had me photograph the girls’ class art-show and upload all the photos to our photo sharing site so that he could see them. Their artwork is very mature! It’s look like both your older two have excellent hand-eye coordination. .-= Sadia´s last blog ..Austin Children’s Music Festival (and CD giveaway) =-. .-= brooke´s last blog ..I can see clearly now… =-. I absolutely love Emma’s pictures and impressed with her level of detail. Most Anna’s drawings will be right there with Johnny, but not as detailed. .-= Natalie´s last blog ..Geography Track – Egypt =-. These are so cute!!! 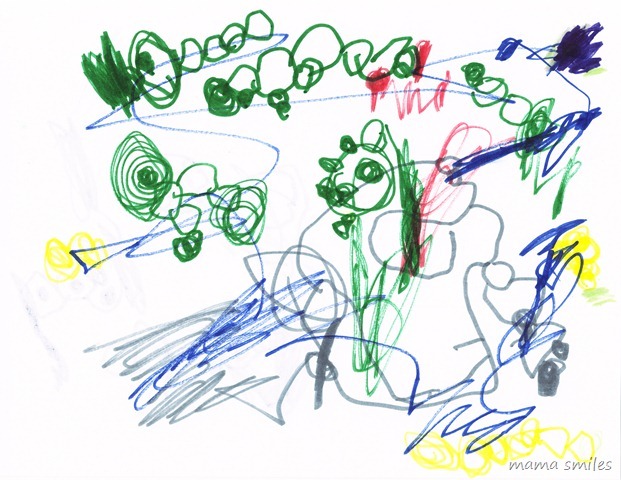 I love kid drawings, and can’t wait for ER’s scribbles to look like something. Right now she colors rainbows over and over and over and over…and I’m ready for a new phase of creativity. .-= Katie´s last blog ..Review & Giveaway: The Madeline Movie: Lost in Paris =-. I’m constantly trying to figure out what to do with the seemingly endless works of art Kaia creates. I absolutely LOVE that she is so interested in drawing, but I don’t love the piles of paper. I love this idea of scanning the photos and then maybe making a slideshow of them. I just got a book from the library called Drawing with Children by Mona Brookes. It contains lessons for children and also for beginner adults (I definitely fall into that category when it comes to drawing) so you can learn how to draw better step by step. Kaia and I are going to start the lessons tomorrow and I’m curious to see what happens. I am so impressed by Johnny’s piece. Asher’s pictures are basically still scribbles, which I think is totally fine. Reading the book Young at Art really changed my perceptions of what children “should” be doing when it comes to art.